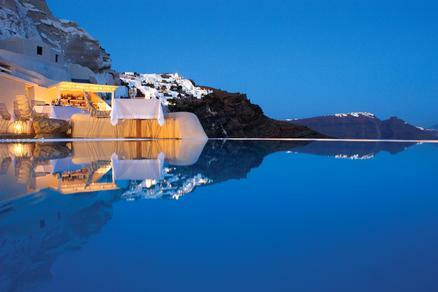 Mystique Resort, Greece 0.0 out of 5 based on ratings. 0 user reviews. Situated on Oia's famous cliffs, the stylish Mystique features dazzling views of clear blue waters, the volcano and the Aegean Caldera. Surrounded by some of the world's most beautiful scenery, the resort's island-style design pays homage to nature. Its 18 villas and suites are spread across 2,000 square-meters. All accommodations are finely handcrafted from wood, stone and glass with enticing patterns carved into the walls. Spend a day beneath the clear blue sky in the infinity-edge pool. Gather together for a casual drink, delicious meal at the Aura Pool Bar, the Charisma gourmet restaurant or the Secret wine cave. Mystique is a natural exclusive retreat reserved only for the most discerning travelers.